Like many gardeners I have a seed collection scattered among drawers, boxes, envelopes, seed banks. Sometimes I come across seeds I forgot I had and oftentimes I find them after the seed sowing window has closed for the gardening season. This year I’ve decided to try to be more thoughtful about what I plant and have made myself a seed organizer to file away my seed packs. With this seed organizer I know where the seeds are when I’m looking for them, I’ve categorized them in a way that makes sense to me, and when I’m done I can just place the seed packs back in the organizer until I need them again. The best part is that the seed organizer cost me $2.00 to make. My seed organizer is made out of a plastic shoebox from the 99 cent store, some pieces of cardboard, and scrap craft paper. The five dividers organize my seed collection into annuals, perennials, vegetables, herbs, vines and exotic seeds. 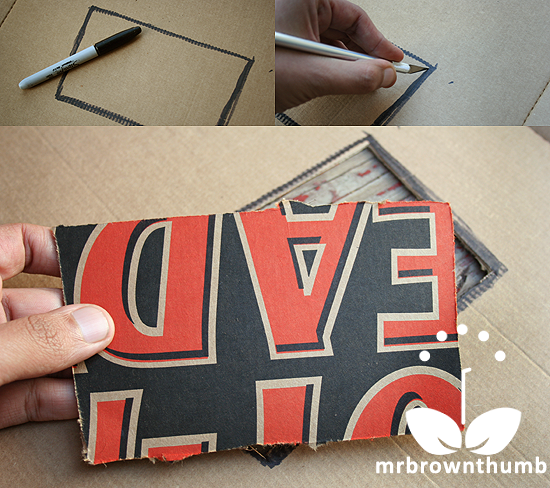 I started out by tracing the outline of the plastic shoebox on a piece of cardboard using a thick, black marker. Next, I used a sharp blade to cut inside the lines, extracting the shape I needed. It is important to cut inside the line as your divider needs to be slightly smaller than the shoebox to fit properly. For this seed organizer I created the divider out of scrap cardboard but you can use foam board. To hide the cardboard or rough edges of the foam board you can wrap the divider in paper like so. Depending on the size of your seed collection you may want to make more dividers than I did. 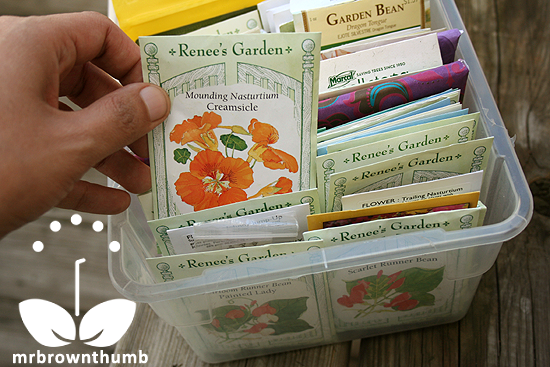 A small seed collection may benefit from several alphabetized dividers. Gardeners with a large stash of seeds may benefit from making two homemade seed organizers, and dedicating one to flower seeds and another to vegetable seeds. Take the idea and adapt it to your needs. 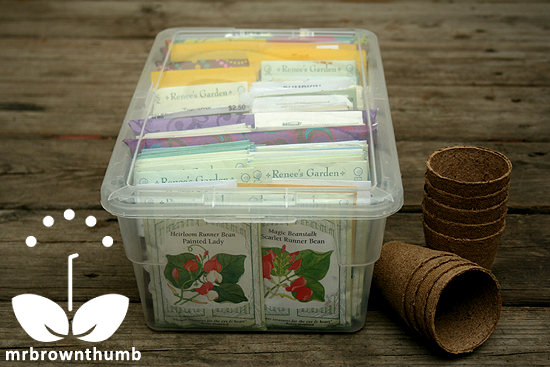 Make a seed organizer today to keep your seeds in a place where you’ll have easy access to them as you begin or continue sowing seeds for your garden. For an hour's worth of work and $2.00 I'm pretty happy with my homemade seed organizer. It is a lot less expensive than comparable seed organizers on the market. I can’t believe that it has taken me this many years to realize the benefit of keeping seeds in one easy to find location. Hopefully I can continue to stay organized because my seed collection is expanding and I need to use seeds before they lose viability. 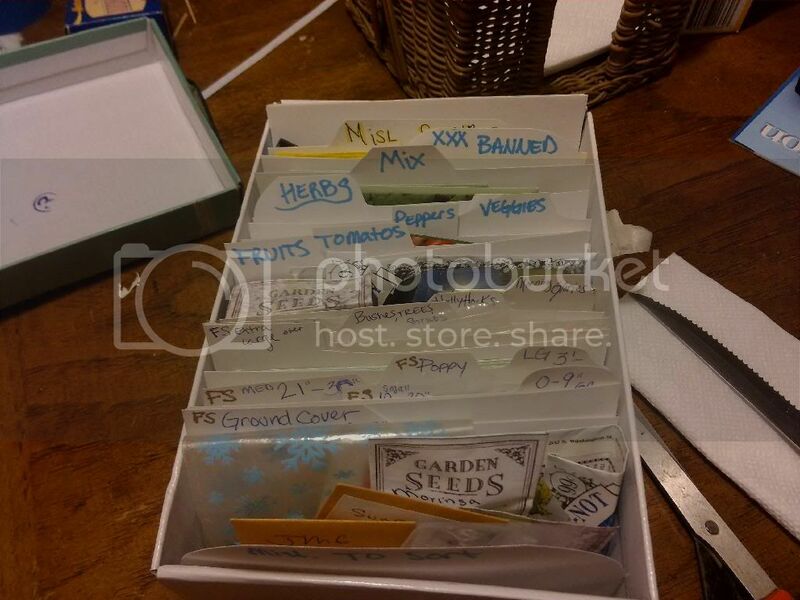 When you make your own organizer to file your seeds make sure to leave some room to keep your homemade plant labels and tags in it too. The seed organizer's portability should also come in handy the next time I attend a seed swap or need to carry my seed collection to a school garden to help start a seed library. Are you saying that we should never throw seed away. I have seeds for vegetables that are 5 to 10 years old. Great idea using dividers. I made my first seed keeper this year after having seeds all disorganized for so long. Now to remember to place them back in the right place. I store my markers and labels in the box as well. I store mine as summer and winter but I'm going to try and use more categories as my seedbank grows. This looks great and I have one of those plastic shoe boxes sitting on a shelf doing nothing. It came with a larger tote and I hadn't found a use for it yet. It looks like a great size for this. Making the dividers is very smart. I have two small plastic baskets that were intended as little Easter candy baskets. They used to be enough (perfect width for seed packets), but now I have a lot more seeds on hand than I used to. Time for an upgrade. Having a lid to keep it all secure would be better too. Thanks for sharing your idea. Nice! My seeds are in two aluminum boxes that used to hold peppermint bark, but they're too shallow for dividers. Love this frugal and elegant solution. I have extra bits of wrapping paper that should work nicely as covering. Just need to get a box next time I'm at the dollar store. P.S. I'm on board for any excuse for a Hot 'n' Ready. Pizza! Pizza! Myself I use the boxes that Botanical Interests mailed my larger orders of seeds in. The boxes are pretty and perfectly sized already. I just used paint markers to write the type of seed inside each box (veggies, fruits, perennials, etc.) and then put the packets in alphabetically. My mother turned me on to using file cabinets. It works well for me. I've picked up some little file cabinets at Goodwill. I've got one for cucurbrits and one for most other vegetables. My husband bought a big toolbox with sorting trays for hardware and I use that for legumes. I love to see you getting crafty, Mr. BT!!! This is awesome! I wish I had more seeds laying around. If I ever get any, I plant them quick, before I lose them!!! Maybe I need a box!!! Ahhh...now's here's a project that will help me and can be knocked off in very little time. Thanks for inspiring me! My friend collects and gives me a lot of seed from her garden each year with detailed planting instructions including whether the seeds should be planted in SPRING or FALL...I've been keeping my seed collection in small paper bags. Sadly, I misplaced one of these bags or it got accidentally thrown out or something - all seeds I had carefully collected from plants gone to see at our local Botanic Garden last fall....ugh. I can't let that happen again, and you have motivated me with this quick and easy way to keep them organized. It's so true, you reach that point at some time when something has to be done because you've acquired so many packs of seeds! I reached that point last year. My system is similar, but I made individual folders out of old file folders that fit inside a tin box I had. I break my seeds down into types: peppers, tomatoes, greens, brassicas, etc. I also subcategorize with folders for seeds I have a lot of and that need planted at different times, like: fall greens, spring greens, summer greens, etc. I also made little sheets for the front of the folders so I can see at a glance what's inside. I bet an accordion file would be nice too, one of those one with the handle so you could carry it around. I have a friend that keeps hers in a big binder that's filled with those pages that you could put photos in (with 4 spots per page). That way she can flip through and see what she has (they're categorized by type). I need to make a new seed storage box. I like how you created the dividers. You are so organized! I try to keep mine organized, but I'm always taking them out and mixing them up. Go you! I've done something similar with a simple plastic storage box - and the tops of used manila folders. I cut the folders tops with the tabs to the correct size. Colored them with highlighters, and labeled from the printer and taped them on. Like you said, a few hours work and great results! with tabs. Someone advised putting rice into the box to make sure that it stays dry. After years of stashing seeds in shopping bags, and boxes left over after the candy was gone, I started "filing" them in logical groups in brown paper lunch bags with the contents written on the outside of the bag and the bags all over the floor of a little-used closet. At least they're sorted now, but it still takes some rummaging through the closet to find the correct bag. I like your idea much better! Thanks for the heads up about this post. After my seed disaster this past weekend I'll need something like this moving forward. Mr. B knows about my story, but if anybody else wants to check it out go to http://wickerrooftop.wordpress.com/2011/04/24/a-gardening-incident/. What do you think about throwing in a couple silica gel packets to keep moisture out? Do seeds need a certain moisture level to keep them viable yet without sprouting them? Or the drier the better? Great ideas! I use a folded down paper grocery bag as a file. For the seeds I fold my collected seeds in a paper towel and slip that into a labeled sandwich bag left open so the seeds can dry further. You can also use CD envelopes and those come in bright colors. Cheers! Then if I have, a lot of one kind (like poppies, tomatoes, Morning Glories ect) I have a section devoted to each of them.